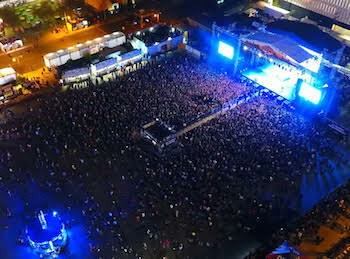 Festivalgoers can expect to hear fan favorites and possibly new music from Sin City mainstay and Saturday night headliner Five Finger Death Punch, who just released their greatest hits album, A Decade Of Destruction, on December 1. A Perfect Circle—featuring Billy Howerdel, Maynard James Keenan, James Iha, Jeff Friedl, Matt McJunkins—headline Friday night with an eclectic set that may include their new single, “The Doomed,” their first new song since 2013, which will appear on their upcoming 2018 album. Early bird tickets were available on Wednesday, December 6 at 10:00 a.m. PT, for those who purchased tickets to last year’s event. Presale tickets were available Thursday, December 7 from 10:00 a.m. to 10:00 p.m. PT. 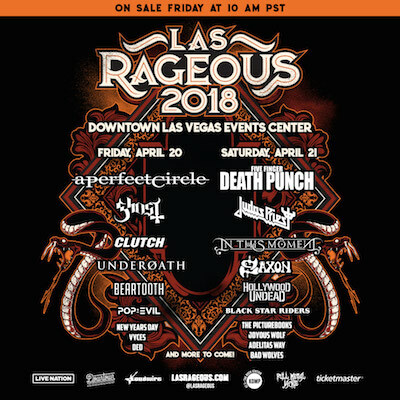 Presale passwords could have been obtained by signing up for the Las Rageous email list at http://www.LasRageous.com, or from radio partner KOMP-FM. General tickets became available to the public on Friday, December 8 at 10:00 a.m. PT. Tagged A Perfect Circle, Clutch, Five Finger Death Punch, Ghost, In This Moment, judas priest, las rageous, las vegas, saxon, underoath.